Wash and shuck oysters, reserve all the liquid and the cupped shell. Dry the cupped shell and rub with garlic. 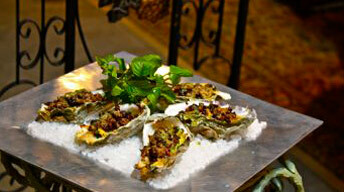 Place the oyster’s shells on a bed of rock salt set on a heavy baking pan. Divide the shredded zucchini equally among the shells and season with salt and pepper. Top each bed of zucchini with 1 oyster. Brush each oyster with olive oil, a dollop of tapenade and a sprinkling of bread crumbs. Bake 4 to 5 minutes and serve warm. Cut mushrooms into 1/2 inch strips. Heat olive oil in a heavy skillet over medium-high heat; add mushrooms and sauté for one minute. Stir in marsala and olives; cook for one additional minute then remove from heat. Transfer mixture to food processor and pulse until coarsely chopped. Transfer tapenade to bowl; stir in herbs. Season to taste with salt & pepper. Tapenade can be made up to two days ahead.